Delicious “bakery style” banana chocolate chip muffins made a bit healthier. Looking for some more delicious banana recipes? Try this healthy banana bread, these banana cupcakes, or these banana muffins. Let’s go bananas for bananas! My toddler and I have been baking with bananas like crazy that last couple of months. It all started with us having a few ripe bananas in the house that I needed to use. However, we quickly worked our way through those and we weren’t off the banana kick yet! So we bought some more bananas and got a little creative in “speeding up” the banana ripening process (baking the bananas — more on that later) just to have more ripe bananas to work with. Wait, you can speed-up the ripening process of bananas? YES! And it actually works pretty well. Simply place a few bananas on a baking tray and bake at 350 degrees F for 6-12 minutes (depending on how ripe the bananas are to begin with). They’re ready to go when the skins turn black! Now that you’ve got some ripe bananas, let’s get to baking! How do you make chocolate banana muffins? You’ll start by tossing together the dry ingredients. Add the chocolate chips in at this point as well. Use VERY ripe bananas – if not completely ripe see above. Thoroughly mash the bananas for this recipe – use hand mixers if needed! In another bowl whisk together the wet ingredients, then combine wet and dry ingredients and mix until JUST combined. Mix as little as possible to keep these muffins light and airy instead of becoming dense. The more you stir, the denser these will become. Separate the batter in your prepared muffin tin and bake! Use fully ripe bananas. I’ve already said it, but I’ll say it again — when they are their ripest they are also at their sweetest. I’ve found when the skins are pretty much covered in speckles they make for the very best banana baked good. Layer on the chocolate. 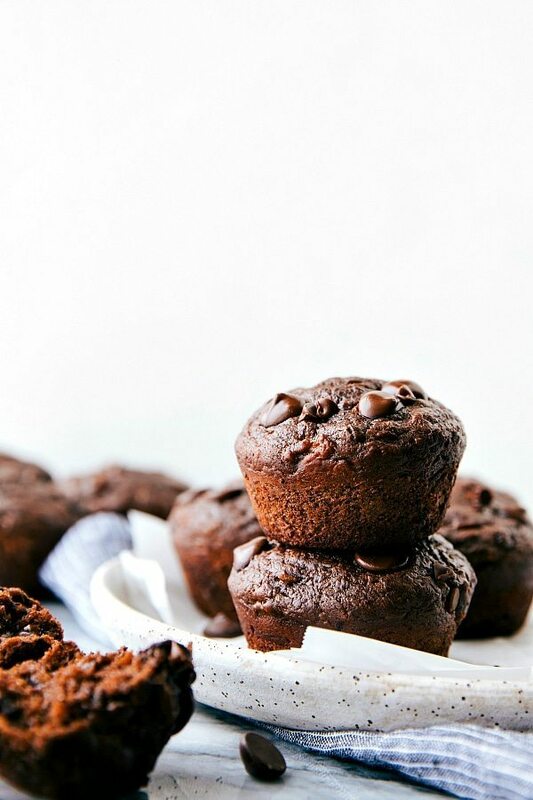 Making these chocolate banana muffins with cocoa powder AND chocolate chips is what makes them taste so good! Experiment with your favorite chocolate chips – I’ve included my favorite combination in the recipe below. Add some Greek yogurt. I’ve tried 3-4 different types of Greek yogurt in these. Plain or vanilla is best with vanilla being my absolute top preference on flavor. The type of yogurt you use matters — the creamier and thicker the yogurt, the better these are. Finally add the Flour: I remove 1 tablespoon of the flour and replace it with cornstarch to make a lighter “cake-like” flour. This gives the muffins a lightness comparable to bakery style muffins! Once made, how long do these chocolate banana muffins last? These are best consumed within 2-3 days of being made. Freezing is an alternative if you’d like to keep them for longer. TO FREEZE: Wrap each muffin individually and tightly in plastic wrap and then seal it completely in an airtight container or bag. These muffin freeze safely for 3 months. Defrost at room temperature or in the fridge and make sure to warm them in the microwave a few seconds before enjoying! What other recipes can I use overripe bananas for? Delicious "bakery style" chocolate banana muffins made a bit healthier -- lots of mashed up banana, Greek yogurt, and far less sugar than a typical bakery style muffin. 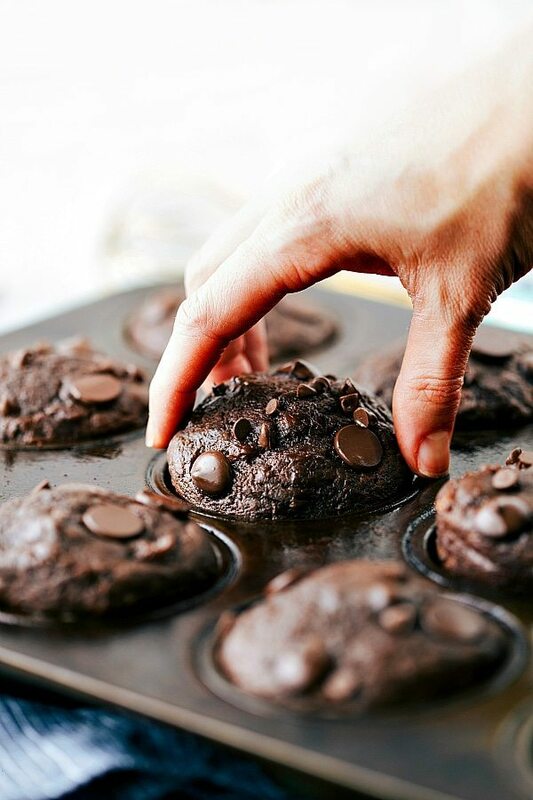 Generously coat a muffin tin with cooking spray and then dust the cavities with cocoa powder. These muffins stick to muffin liners so I do not recommend using them. Remove 1 tablespoon of the 1 cup of flour. In a small bowl, toss together the remaining flour (after removing 1 tablespoon from the 1 cup), cornstarch, baking soda, salt, cocoa powder, and both types of chocolate chips. Stir. Make sure your bananas are at their very ripest (black skins are best; see post to speed up the ripening process if not all the way ripe.) Remove the skins and mash the bananas extremely well. In another bowl, briskly whisk together the egg and Greek yogurt. Stir in the melted coconut oil (slightly cooled, but measure in it's melted state),vanilla extract, brown sugar, and the extremely ripe mashed bananas. Combine wet and dry ingredients and mix until JUST combined. Over-mixing results in denser muffins. Separate the batter evenly among the 12 cavities or fill up 9-10 for extra large muffins. Bake for 18-23 minutes or until a toothpick comes out clean when inserted into the center of a muffin. When ready to enjoy a muffin, microwave for 15-20 seconds. Spread with peanut butter if desired! The dark chocolate chips is purely for a healthier option. If you don't like dark chocolate feel free to use milk chocolate or semi-sweet -- whichever you like best! ooooh these muffins look so chocolatey and moist! Totally perfect! I made these today with spelt flour. I forgot to remove one tablespoon. Also, I added about 1/3 cup of flax meal. These are delicious! I was careful not to over mix and they turned out so tender and moist. These look delicious! I just put a batch in the oven and can’t wait for them to be ready! Instead of flour I used 1/3 C whey protein and a little less than 1/3 C coconut flour. What are you supposed to do with the tablespoon of flour once to take it out? Did these turn out well wth the coconut flour and whey? I made banana bread last week for the first time in ages and now it’s all I can think about!! These muffins look awesome! I cannot even handle how gorgeous these muffins are Chelsea! Oh, and my kids make me say ba-na-na like erry single day. Maybe it was in the video (I’m at work so I didn’t watch it), but what was the 1tbl of flour removed for? 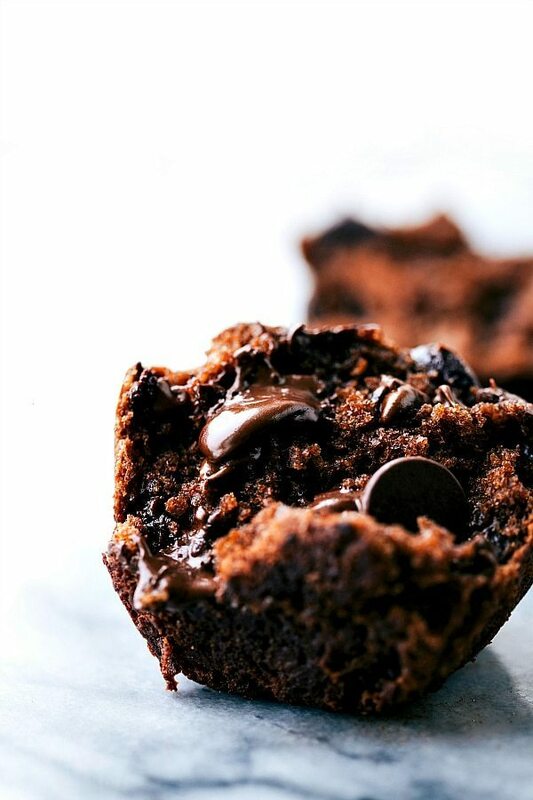 These chocolate muffins are EPIC! Those melty chocolate chips in the middle are everything! These look amazing, and my 5 year old and I just finished making them. But, I realized (too late!) that we never added in the vanilla, so I reread the directions again, and it never says to do it. So, you may want to add that in for direction followers like myself! We make your recipes all the time! Ack!! I’m so sorry about missing that in the directions! I so appreciate the heads-up and I just updated the recipe so no one else misses it! Luckily without vanilla extract they shouldn’t be TOO different, so I hope you love them! So fun to bake with your five year old 🙂 Thanks for the comment! I made these today for Valentine’s Day and my husband is still raving about them! Our little guy told me they really good numerous times too! And they were so easy! So glad I stumbled upon your recipe and can’t wait to try some more. This recipe was incredible! Have you tried this in a 9×5 loaf pan? Do you use extra virgin coconut oil that smells like coconut or the refined coconut oil that doesn’t? Is there a reason for the coconut oil over another type of fat? My son can’t eat coconut so I would need a different fat… Suggestions? Amounts? These look delicious & a sure way to get an extra fruit in my extremely picky eater. Thanks! Hey Cheri! I haven’t tried a substitute for coconut in these muffins so I can’t say for sure, but I do know a lot of readers have had success using canola oil in place of coconut oil for my recipes. I hope that helps and wish I could be of more help! I used 2/3 butter and 1/3 applesauce (don’t usually have Coconut oil on hand & am trying to cut calories where I can.). They came out tasting like amazing moist cupcakes. I just Love Chelsea’s recipes! I tried these and they came out great! Chocolately and moist! The only substitution I made was butter for the coconut oil I don’t like coconut. I also froze left over muffins and they held up very well. Thanks for the recipe! These muffins were delicious! I made them into mini muffins for a baby shower. I subbed half of the flour for whole wheat, and put in applesauce instead of the oil, and they still tasted decadent. My husband loves them. Theses are a huge hit and a keeper in my house! Yay!! So glad to hear that! And what a fun idea to make them mini for a baby shower 🙂 Thanks for the comment!! These look delish! I never knew you could bake bananas to speed the ripening process. Thanks for the tip! Yes, it’s one of my favorite banana bread hacks 🙂 Thank you so much Emily! I’m not a big baker so these did take me some time, however, it was worth it!! They were delicious! Made these just now and they are SO soft and moist! I didn’t use corn starch and I subbed coconut oil for vegetable oil and they were STILL so light and wonderful. Not too sweet, either. I tried your quick ripening trick and it worked like a charm. These are keepers! My roommates had never had “real American” muffins and they were very impressed with these. Next time I will try to substitute the oil for applesauce like another commenter did. Thanks for the stellar recipe! So glad to hear these were so enjoyed! 🙂 And I’m glad that quick ripening trick worked for you! Thanks for the comment!! How many calories are in one muffin? I’m excited to try the recipe, these look amazing! But I’m trying to shed some baby weight & am watching my calorie intake…anyone have a ball park figure? ? Just wondering if you think they’d hold up well if I make a few dozen and freeze them individually for quick snacks? I often do that with my regular recipe- but this one looks even more delicious! Thank you for your compliment Sarah! 🙂 I unfortunately have never had any left over to freeze so I can’t say for sure, but I have had readers comment on other similar muffin recipes on my site that froze them with great results. Hopefully someone else can comment here! I usually make a huge batch of Chelsea’s muffins every time I do (like 5-6 dozen), and we freeze a bunch. They freeze really well. Just microwave them for 30-45 seconds and they’re just as gooey and moist as when they come out of the oven. Haha!! I haven’t actually tried freezing these, but I know a few other readers have frozen similar muffin recipes from my site with great results. Sorry to not be of more help! Hopefully someone else can chime in here! 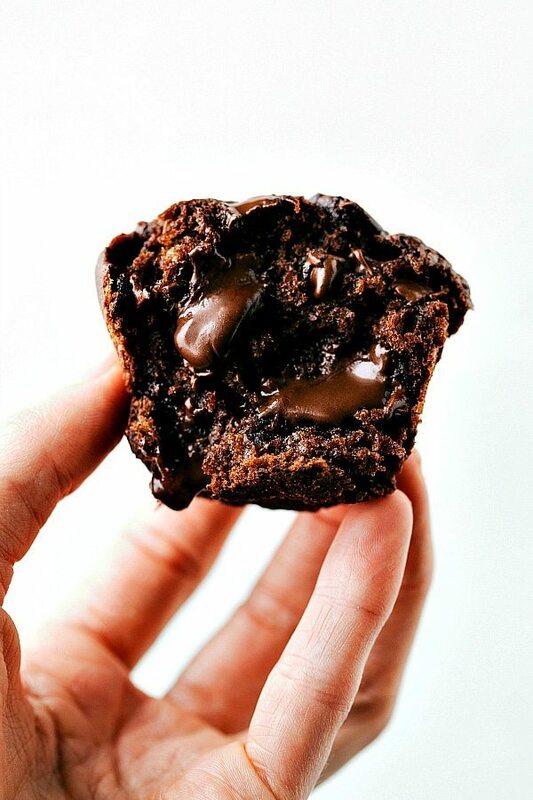 What mini dark chocolate chips do you use? I can’t seem to find them any where! Seriously amazing… so moist and gooey, yet such a healthy recipe. These could easily pass as cupcakes. Will satisfy your chocolate craving anytime! Yeah!! SO great to hear a healthy recipe could pass for a cupcake 🙂 Thank you so much for your comment and trying these out!! Splendid muffins. They taste even better the day after since I am not a banana fan. Very moist and chocolaty and healthy. So glad to hear these were enjoyed! 🙂 Thanks for the comment! Looks awesome ! Can I ask if I can replace coconut oil with vegetable oil? I’ve never tried it so I can’t say for sure without further recipe testing, but I don’t see why the substitution wouldn’t work. Yes, I’ve used vegetable oil and they’re great. Made this today and I must say, I now have a new favorite. So moist. Chocolate without the guilt. So happy to hear that!! 🙂 Glad these were enjoyed! Thank you for this recipe Chelsea! Just wanted to let you know that my favorite cupcake liners are parchment paper and these don’t stick to them. In winnipeg we have them at all our grocery type stores. My silicone reusable ones word as well. ? thanks again for the recipe! I made these today and they are absolutely delicious and gorgeously light! I couldn’t wait for the batch to cool and ate the first one (almost) piping hot. Thank you so much for sharing the recipe, Chelsea! If you do make the substitute you’ll need about 4x the amount of soda when using powder. However, I haven’t tried it in these muffins so I’m not sure exactly how much. Baking powder doesn’t substitute for baking soda in an exact way. Even with that substitute the taste may be a little off. Made these yesterday with my toddler .. They are absolutely delicious! So moist and chocolatey .. It satisfies that chocolate-cake-craving and love that it’s healthy. I used only 1/3c of chocolate chips total and used a tad less sugar and still turned out decadent. Froze some for toddler’s snack but I now wish I didn’t…. Cuz I’m officially addicted. I made these muffins today. They were so moist and delicious!!! The recipe is a keeper. I agree that the bananas need to be black to give bread and muffins good flavor. Thanks for the tip on how to ripen bananas quicker. Had never heard of doing that. Thanks for a yummy recipe!!? My daughter is ‘sick of banana bread’, so I asked her if she’d like to try these muffins of yours instead. Of course she couldn’t say no to double chocolate banana bread, so we made these today and they are amazing! Not too sweet, but such a treat all the same. She’s excited to take one on her school lunch tomorrow. Thanks for posting this delicious recipe! I’ve been baking these with 1/4 c. sugar, plain yogurt and no chips at all, and my kids still adore them. Thanks for your help CG! Super impressed with this recipe. Sometimes you never know what you’re going to get with recipes from blogs, but this was legit! I’ll be saving this for future recipes. So gooey and delicious. I’m thrilled you enjoyed these so much! 🙂 Glad it gets saved with future recipes 🙂 Thanks Fallon! I will DEFINITELY be making these again very soon! So gooey and good! I didn’t have and white whole wheat flour so I did half all purpose and half regular whole wheat. Also, I skipped the sugar and added just about 1/4 cup of maple syrup. They’re getting eaten up right now! As for LOADS of bananas.. especially frozen and ripe.. try Banana Nicecream; Instagram is a good source to go and drool over that.. recipes? GIYF! Yay!! It is so great to hear these were such a hit! 🙂 And yes good quality ingredients sure go a long way 🙂 Thanks! Hi, can I use oat flour? I took your advice to heart about the muffins sticking to the paper liners, and I sprayed my paper liners with Pam. Perfect solution! Great recipe. So yummy! I used oat flour instead of flour, 1/4 cup maple syrup instead of brown sugar and added chocolate protein powder and they turned out amazing. Jordan, did your muffins rise with oat flour instead of white whole wheat flour? I substituted oat flour for the wheat flour and my muffins did not rise at all, but they were delicious nonetheless. Why remove 1 tablespoon of the 1 cup of flour? I can’t wait to try this recipe, but does it last only for 3 days? Super delicious!!! Kids and whole family loved them! Very easy and fast to make! Thank you and greetings from Costa Rica!!! Pura vida!!!! So happy to hear these were enjoyed! Thanks so much Karla! 🙂 And, wow, Costa Rica, how cool! OMG! I never comment on recipes but these were the best ever! I made it exactly as written but as I measuring out ingredients realized that all I had left was Noosa lemon yogurt! So I used that! And I was nervous but they were amazing! My husband can’t stop raving! And to have a muffin recipe so light and flavorful with white whole wheat flour is spectacular! I usually make muffins with half white whole wheat and half all purpose. THANK YOU for an incredible recipe! 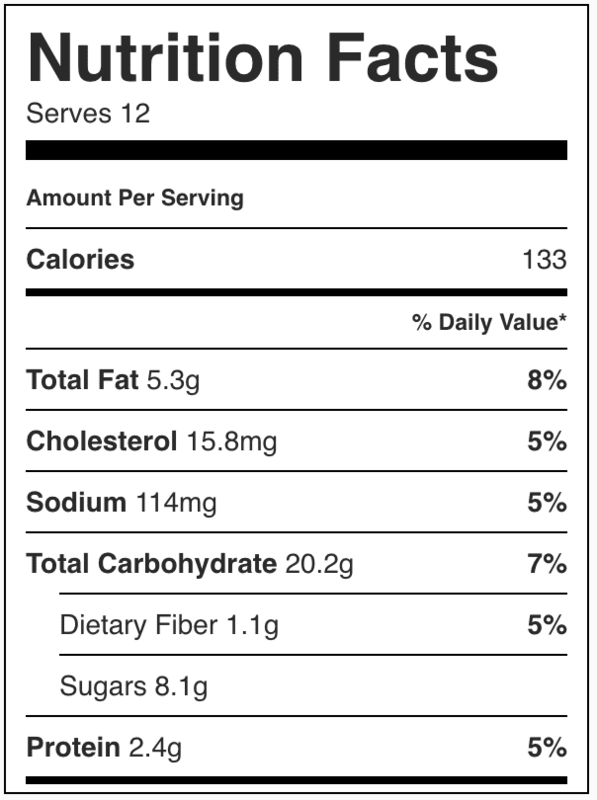 Any idea what the nutritional info is? They seem like a healthier option if you have to have a chocolate muffin but probably still high calorie, fat, carbs? Hi Amee! I don’t have nutrition stats on these yet. I’d recommend using My Fitness Pal for the stats 🙂 Enjoy! Thanks so much. These look delicious! Wow my message lol i need to slow down with the typing hahaha I kept them in the oven 25 min and still look uncooked I also used wheat flour. I feel like mine dont taste good soo sadl i feel like i copied this recipe perfect too? It sounds like your oven might be an issue if you cooked them for that long and they were still under-baked. Is your oven calibrated? And did you for sure set it to the right temperature? Made these tonight and they are delicious! Another great recipe! Thank you so much Tanya! 🙂 So glad you enjoyed these! Somebody brought me these last week & my kids loved them. I tasted & didn’t see why they liked it so much. THEN I asked for the recipe so I could make it myself. I made this recipe exactly as written, using 100% whole wheat flour and WOW! These are decadent, filling…just Amazing! I made 1 recipe and after tasting one I had to immediately make another batch so I could share with a friend! I already added cocoa powder & Greek yogurt to my shopping list this week so I can make these again! Next, I’m trying your blueberry muffins! So excited!! Hi Farah! I am so thrilled these were such a huge hit that you and your family enjoyed! 🙂 Thank you! I hope you love the blueberry muffins next; those are my husband’s favorite! These sound amazing! I am wondering, just idle curiosity, if you tried any Greek yogurt with fruit in it while making these. I have a feeling something with chunks of cherry would be stellar! What if I do not have corn starch?? I bought everything else and thought I had corn starch and I do not.. Ahh! You’ll be fine without it 🙂 It makes them a little softer, but they will be great without. These are absolutely amazing!! I’ve made them a couple times and they don’t last over 24 hours in my home…too good! Thank you for the knowledge and love the idea of baking the bananas to ripen them more. These look decadent!! Going to make them today made a special trip to the grocery store for coconut oil. Hubby is crazy over dark chocolate so I’m sure they’ll be a hit . These are my absolute favorite chocolate fix! So moist and lots of chocolate. thank you for this recipe!!! SO happy to hear that! Thanks for the comment Crystal! I attempted to make these today, except the entire batch was ruined. I think that it would be much easier to understand in the recipe if it stated to “discard” the 1 tbs of flour that is removed from the 1c and then to mix the remaining flour with the chocolate chips etc. I mixed the 1 tbs of flour with all these ingredients thinking there would be another step calling for the remaining, however, I forgot and didn’t realize until my muffins turned out to be a wet mess. I know they would’ve been delicious because the flavor was still great while I was dumping them into the trash. There is another step asking for the remaining flour — Its the very next step that says “in a small bowl, toss together the remaining flour…” I added another note to the recipe to help clarify, but the instructions did ask for the remaining flour right after asking for 1 tablespoon to be removed. 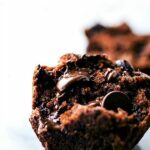 These are amazing and is the best chocolate banana muffins ever! I won’t be looking to try at any others cos this recipe is perfect. Followed the recipe exactly the first time round. Subsequently I did not use the cornstarch and I used melted butter instead and it is still amazing. Thank you for sharing! And my 4yr old gets so excited to bake and eat them! What a compliment! 🙂 I’m so thrilled these have been a hit! Thanks Lina! You are welcome! 🙂 Thanks so much for the comment; I’m glad these are a hit! This may sound like a dumb question, but is the cocoa powder sweetened or unsweetened? Thanks! So happy you enjoyed these! Thank you Tuqa! I baked them a couple of times for my friends and they all loved it! I was always careful about the temperature of the ingredients and the ripeness of the banana, and muffins turned out so well. Thank you for this reciepe, it’s now my savior when people come over. HOLY CANNOLI THESE ARE GOOD! I made this recipe twice in 3 days, they’re that good!! thank you thank you thank you!! My Minnie muffins came out moist & delicious! I used whole wheat flour and almond flour with dark and semi sweet chocolate chips. I had also used coconut cooking spray (Trader Joe’s brand) to grease the muffin pan. Thanks so much for the recipe!? What a compliment!!! So glad these were a hit; thanks for the comment Sarah! I made these yesterday with vegetable oil instead of coconut and wow!! I’ve eaten am embarrassingly amount already. Thanks for the recipe! I made these to use up overripe bananas and used whole wheat flour as that is all I had. Oh my yum! These are moist, tender, delicious. These will make their way I to my kids treat rotation. Thank you for sharing the recipe! I made the muffins and they are delicious and moist! They look soooo good!!! I shared your recipe with a link in my last post! Thanks for your awesome job. My new fave!! I’ve tried other “healthy” muffin recipes, but this one is by far THE best!! Even my picky eater loved them! It shouldn’t affect the taste much, but will the overall texture/rise of the muffins. Made these last week, I was searching for a recipe to combine bananas & yogurt. I just used butter instead of coconut oil and added a little less choc chips. They turned out great, I liked that they are on the bitter side and that they are low fat actually! The only thing that disappointed me just a little is that they didn’t rise as much as I would want them to… they came out 9 and I bake in a normal sized muffin tin… Overall I will definitely bake them again with a few tricks to improve for me! Hey Athena! I’m glad you liked these! 🙂 They do rise well though, so you might just want to make sure your baking agents are fresh as that might be the culprit! I will try that thanx! ? Can you try oatflour with this recipe ? Or another gluten free option ? How many calories are one of these muffins? Made these this morning and they were easy and delicious. My whole family loved them, even my super picky 6 yr old. The only thing I changed was I added only half of the brown sugar and they still were sweet enough for us. Thanks for the great recipe. These look so great!!!! I always have tons of frozen ripe bananas to keep them – do you think it makes a difference if I thaw them for the recipe? Thanks girl! Hm, I’m not sure, but I would thaw them just to be sure they aren’t too watery! Enjoy these muffins! Love these muffins!!! Possibly my favorite healthy dessert so far and I’ve tried a lot! I substituted apple sauce for the coconut oil. They were fluffy, moist, and delicious! I wanted the recipe and saw in the video she posted (your video) that you were the actual author. I thought I’d let you know that this person took all of your original content and is seemingly posting it as her own, with just a non-clickable link at the bottom of the page. Wow these are really moist and delicious! I used regular vanilla yogurt, white flour and canola oil as that is what I had on hand. I used 1 cup semisweet chocolate chips. Made 16 muffins with the yellow scoop. Baked for 15-18 min. Will be making these again! For those of us on WW Freestyle program, the muffins are 5pts. each. Hi I will be making this tomorrow with my 8 year old. Don’t have coconut oil on hand. Will olive oil make a good substitute? If yes (I’m hoping its a YES! ), would it be the sake measurement? Omg! These turned out de-licious! I didnt have yogurt but substituted with sour cream, totally worked. You’re absolutely right about 2 sizes of chocolate chips, excellent. My family thoroughly enjoyed them and i will make them again! I’m so glad you guys enjoyed!! And i’m happy to hear the sour cream substitution worked out! Thanks Mandy! I probably won’t get a reply in time to use the recipe, but i’d like to omit the chocolate chips and use cocoa powder, and maybe add some chocolate protein powder. is that possible at all? No; unfortunately cocoa powder/protein powder is completely different than chocolate chips so they would dry out the muffins to have the additional dry ingredients. Not sure if I’ve commented on these before but they’re worth a second comment anyway. These are my favorite muffins to keep on hand. I’v been enjoying your recipe for some time and just wanted to thank you for it. I keep a batch of these in my freezer at all times. I’v got some cooling on the counter now that I can’t wait to dig into with a big glass of milk. These turned out so moist, chocolatey and delicious! I may have snuck a little bit of extra cocoa and a few extra chocolate chips… I also couldn’t crumble off much from my rock hard brown sugar so I opted for 1/4 cup of white sugar plus a squirt of honey. It was plenty sweet, the cocoa/chips may have made up for the lack of brown sugar but I didn’t want to take my chances. Highly recommend. My friend even said these were better than brownies! Yay!! So happy to hear these were a hit! 🙂 And better than brownies?! Quite the compliment 🙂 Thank you so much Laurel!